This entry was posted in Nature, Outdoors and tagged backyard birds, Beautiful, Bird, Birdwatching, Photography, Photos, tree bark, Wildlife, Woodpecker. Bookmark the permalink. Michelle, you are wise to be concerned about the dangers of isolation. As a single person, I have observed that cities and towns are better suited to the single life than rural areas. Of course, many people like the tranquility of rural areas, so there’s a tradeoff. I stumbled on the building I’m in by complete accident. It’s owned by the medium-sized city I live in. One third of the apartments are reserved for very low income; one third for moderately low; and one third are “market price.” It’s a blessing, because I couldn’t afford living near my relatives otherwise. Thank you, John. Honestly, it is really worrying me! I wish so much I had asked for more time. I might be able to. The landlord is out of the country, so she is okay with me changing my mind, but the program that helps me pay my rent, well, they are not nice people working there anymore, and they do not act like they care one iota about me as a human being. I am a number. They told me I have to come to the office tomorrow, and they are sending me to another county, as per my request, but I told them I wanted ’til January, so I don’t know what they will say if I tell them I am worried about being too isolated, which I will be. The neighborhood is nice, and people work in their yards, but I don’t think it is the kind of neighborhood where folks gather at all. I truly wish I could find something like you have. I need people so much these days. I love going into town and seeing people I met twenty some years ago. And, the towns nearby are very cool towns. I hope things work out. I’m a little upset, as you can probably tell. I’m trying to have faith, but I’ve learned that in this world, when poverty and sickness is a companion, I must fend for myself. Thanks for the good luck wishes. I will need them. I’d tell you about the place, but since this is online, I will refrain. Take care, and I will surely let you know what I decide. I am really pleased Ruthie Mae is helping heal you Michelle, nothing like taking a breath of fresh air into our lungs to help make us feel brighter.. And what a delightful winged visitor, You have such a variety in your back yard, You reminded me too about the Sunflower seeds I must bring them back from our garden shed in the allotments for the bird table.. Yes, my yard is lovely. I think I am finally going to move, Sue. This post is making me sigh inside about leaving my yard behind, but if I go where I am thinking of, there will be plenty of wildlife to invite for a visit. I’m not sure what a fat-ball is, but perhaps like the cake of suet? I put out a suet cake with sunflower seeds in it, which brought a flock of blue birds within five minutes, but it was the one with peanuts for energy that brought this beautiful bird you see in flight (in the above photo). I think this is the Downy Woodpecker. Is such a lovely bird, and very friendly. They will eat from your hands in Summer. I guess I got some type of flu bug, after having bronchitis last month, so I’ve been sick and I lost weight. I hope I’m mending. A neighbor, who is a friend of my son’s, made me some great chicken soup! He’s a Deacon and soon to be Priest at the church my son is going to now. They are great people. I’m sorry to move away after meeting them. (Wow, this post sure is bringing up my emotions about moving. Maybe it is a ‘green healing’ conversation). Yes, Ruthie continues to be a blessing every single day. She is my little angel. Thank you again my friend for adding your thoughts here. Sending you well wishes and dogkisses from Ruthie! Love, Michelle. Michelle, first the Fat Ball is a suet ball with seeds 🙂 I forget how often our language varies in different things LOL.. :-D.. As for moving, I think you need to follow your intuition, Its time right now for new starts as we leave the old behind.. So I know all will click into place for you, as sad as it is to leave a place.. I know you have done this before and you are one brave individual and I know things will fall as they should to help you..
Just send out your thoughts dont even put a thought on its failure, but see yourself already settled and happy in your new home and area and I know it will come to pass.. I am sorry you have been under the weather again with you health, you stand need to catch a virus with your already delicate health.. Just coming through my own Virus of Flu, Its still determined to hang on and somedays the symptoms come back, But on the whole I am 100% better and although its taking its time in leaving I know its building antibodies up.. I dislike taking medicines if I can get away without them.. So I have been using Ivy Thymes tinctures for my bronchial blockages, and echinacea to help and its helped alot to clear the coughing on my chest.. I have a few hours spare this morning, ( Just baked a batch of scones ) before work this afternoon… I know its Sunday, but then I have all week off and start again on Friday, I know weird shifts I do, but I am resting up more now… And things have settled down a little from the hectic schedule I had a few weeks ago.. Thank you, Sue, for your kind and well wishes! I’m feeling better. My son is here now, as he too got sick, but his is upper respiratory. The apartment he is living in apparently had some type of insect/bug problem and the management put out some white powder all over the floors in thick piles. I couldn’t believe it, so that’s why he came out here. I asked them to remove it as it has to be toxic if it kills bugs. He too will move again, but unsure exactly when. Lots of change!!! I have seen myself happy at the new place, although it is a studio and tiny. I’m nervous as it is on the other side of this area I live in, so everything will be different. I know there will be pretty birds where I’m going. Yes, I think what I call a suet cake is what you call a Fat Ball (my birds are fat too)! It’s dove season, so they are coming to my yard in flocks of twenty at a time! They are so pretty, so I wish they weren’t so hunted, but they are the most hunted animal in this country. I’m not sure about your part of the world. I’m glad you are well. Do you make your own Thyme tincture. I have lots of thyme growing. I need some extra help clearing out my lungs, and I can hardly stand an antibiotic b/c they make me sick, plus I don’t like to take them unless I have to either. My son is taking one though as his lungs sounded horrible and he had a sinus infection. With all my love and well wishes to you and yours, Michelle and Family. How horrid that they shoot Doves..
We have seasons for shooting various birds, but not those.. Here on land and farms.. Landowners breed Game Birds, Pheasant, Partridge and Grouse, These birds do not fly high so they are bred especially and released and during certain times of the year, Shoots are organised, usually on Big Estates of Gentry.. Earls, Dukes etc, yes there are still many around the land.. When I was younger, My Dad new a Gamekeeper who worked for a Big Estate and the birds which were too badly damaged with led shot we would have as children… I can still remember to this day spitting led shot pellets out on my plate! when eating the meat of a Pheasant.. We would think it a treat.. As our main meat would be Wild rabbit my Dad caught..
Love and Blessings to you both..
What a wonderful post! Your yard sounds like a little bit of heaven. I hope you are feeling better. Also, great photo of that little bird with wings in action. I wonder if you used an especially fast shutter speed for that? Hi John! Thanks for stopping by to read and see the pretty bird in flight, and also for your well wishes. I’m doing better, but still sick with what I guess is some type of stomach flu/virus. Yes, my yard brings beautiful life! I’m moving soon and am feeling my heart strings pull. I’ve grown to love the wildlife and am familiar with each tree. Days like the one when I took this photo make me want to stay here. I didn’t use any special speed on my camera. In fact, I’m unfamiliar with the camera’s features. I snapped these photos quickly, one after another, and didn’t see this one ’til uploading it to the screen! I didn’t edit the image, so I’d call this a ‘Canon’ moment and an amateur’s luck. Hope you are doing well, John. Thanks again for adding your comment. I recently acquired an up-to-date, but not overly expensive Cannon. Like you, I haven’t figured out the details. I just shoot on “automatic” and the Cannon dies all the work. Good luck with your move. I just moved, so I know how you feel. Thanks John. I don’t know why I didn’t see your comment in the notifications, but maybe it is my computer issue. Yes, automatic works well. 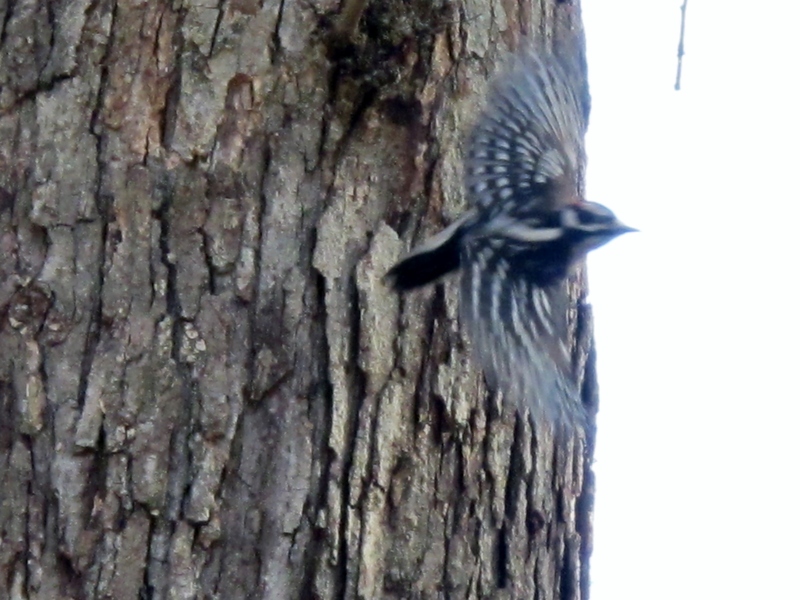 I have some nice photos of a Woodpecker and a squirrel that I took yesterday. Hoping one day I can make cards or something to earn a little money. I’ve thought of your post(s) about small spaces, which I’m moving to. That part is scary, even though I’ve lived in a small space before, but it’s a bit overwhelming to figure out what to get rid of. Are you still in a small place? Thanks for commenting on my little blog 🙂 I appreciate your thoughts! I just moved to an even smaller apt in a different part of MD. It’s a building of 90 very small efficiencies. It’s very well run, and the kind of place where you actually meet your neighbors. (The apts are so small, people have to get out and watch TV in the community room or take advantage of the free Wifi in lobby.) It wouldn’t be for everyone, but it’s just right for me. Only drawback is: no pets. I was fortunate to place my cat with a good home. Cats and some breeds of dog can do quite well in very small apts, esp if they have some access to outdoors. If you have more than one dog, you probably need a little more space. I’ll post some photos soon. John, this sounds like a wonderful set up you have! I hope you enjoy living there and am glad you found a nice home for your cat. A nice and engaged community sounds especially rewarding. I won’t have that where I’m planning to go, which is making me nervous. I don’t have it here, but I don’t like that and so, I wish I could find a place in town. The neighborhood is nice, and the place has many amenities, and no mold, but I’m struggling with the idea that I might be too isolated. I am under the rules of a program that assist with my rent. They won’t help me find a place, but they sure put a lot of rules on the kind of place they will accept. I have to make my decision final on Monday. Thanks for chatting with me about this. I hope my comment doesn’t crawl off the page, because sometimes they do. I look forward to seeing your photos! I still recall the one of your former apartment and I liked it so much. Cardinals stick around here for the winter, so I guess some stay put or go north. We put out suet for the woodpeckers (seen very little of them the last year or so) and our resident white breasted nuthatch. The squirrels, once they figure it out, like it too, lol. Project Feeder Watch has started; our count days are Saturday and Sunday. Rest the week, just like every day, we write down what we see, but not how many unless it’s a special number. Did I tell you that our (note the possessive) fox sparrow who is usually a spring visitor came by this fall? The fox sparrow is much larger than other sparrows, has a reddish tinges, but acts like the other sparrows, except we only ever see one at a time. More furry creatures than usual. We lost our groundhog last year, but our skunk is still around, and we have a possum and probably a raccoon checking out the garbage cans. Hope you are feeling better and get to spend days on the porch with Ruthie Mae. Yes, it seems like the Cardinals all left in one day. We have them during Winter in NC, so their sudden departure surprised me. Thanks for identifying the white breasted nuthatch. What a truly awesome bird! They love my yard. I put my suet in cages hanging by the feeders on a pole, otherwise the squirrels would eat a whole cake in a few minutes, but I offer them a little. They seem happy and full from fallen seeds and other goodies on the ground. I wish I was involved with Project Feeder Watch. I was reporting to Journey North, but illness and computer issues rendered me handicapped! I’m on a netbook now, which is okay for some things, but I need my bigger screen and power. I see a lot of birds, but as you know, identifying them isn’t my best strength. I’m too tired most of the time. I’ll look up photos for the Fox Sparrow. A big bird came to the porch yesterday that was not familiar to me and I thought it was a sparrow, but it was very fat! As far as the night creatures, I like staying away from them, even though the raccoons are cute, they scare me a little. They never come too close, except when Ruthie is sleeping, I guess. Thanks for sharing your green healing notes, my friend. I love our conversations and always, hearing from you. I hope you are doing pretty well. I’m getting over some type of flu bug. I went to the doctor and he asked if I had my ‘shot’ –who gets a vaccine for the flu when she already has the flu? doctors, sigh… Thank goodness for the moments in nature, you know? And love, of course. Take good care phy, and enjoy your birdwatching days! Love, Michelle. There are quite a few different sorts of bird id books — some for backyard birds, some for birds of the region, and some for North America in general. Right now, we are using The Sibley Field Guide to Birds of Eastern North America. It was a gift to hubby, and in 2007, the book new cost around $20. I’m sure that there are used copies of field guides (like Peterson, etc.). Your next goal will be to learn to identify by call/song. I’m not good at that, but hubby is excellent (another gift from me was a set of CDs of the birds of Canada — 2nd hand). His oldest brother apparently learned all the bird songs and sounds of Costa Rica. Unfortunately, he died at 40 from the heredity kidney disease that runs in hubby’s family so I never got to meet him. Some are easy to learn, like blue jays, wrens, cardinals, orioles. Hubby’s hearing is not as good the last few years due to worsening tinnitus; there are bird sounds I can hear, and he can’t. But I don’t know what they are! On our walk today we saw a yellow-bellied sapsucker for the first time in that woods for 2 years! If I say any more about where we walk, it will turn into a rant on the “beautification project” that included cutting down 98.5 or so of the mature trees, and replacing them with bushes, trees that won’t survive the winter, and terraces with more bushes. Better stop there! Yes, I have the Peterson Field Guide to Eastern birds of North America and another one that is an Audubon guide, but that one is more complex in that you search for a bird by the trees or other habitat they live around. I used to be good at identifying butterflies, which I think are generally easier than birds, but my brain is too tired lately to even try. I hope that changes soon! I’m tired of being tired. Once I learn a bird, I don’t forget 🙂 Like the awesome white breasted nuthatch! I love the way it darts up and down the trees, to the feeder and quickly back to the trees. The songs/calls are harder to learn, but I got some CDs at the thrift shop, so maybe while hibernating this winter, I’ll listen to those. Big hugs Phy! Love, Michelle. oh and best wishes to Ruthie Mae…! and I forgot, I see so many Spirits in your tree!…they are watching over you and Ruthie I am sure! Thanks, and how very cool that you can see Spirits!!! That’s awesome 🙂 Please give Maya a dogkiss from Ruthie and a hug from me, xoxo.. Thanks so much for commenting and sharing your lovely thoughts about the birds and wildlife. I had such a wonderful time watching the pretty birds on this day and I’m glad that I shared some of that beauty. Also, glad to know where my Cardinals went! My birdbaths were iced over too, and I know how important fresh water is for the birds, and squirrels too. I saw a big dove bathing! It makes my heart warm to know that what I shared was calming to you. That is truly the best part about writing. Thanks so much maryrose. I hope to be getting outside more often, and I did get the most beautiful photos from my time in my little heaven, so maybe I can soon share more. You stay warm, and take good care. Much love to you! Michelle.